When the entire Apollo stack of LM and CSM arrived at the Moon, it was placed in an orbit that would pass over the landing site at the time of landing. Then once the LM had departed for the surface, the CSM returned to a 110-kilometre orbit if it wasn't already there. While the surface crew carried out their exploration, the Moon continued to rotate on its axis and, in most cases, took the landing site away from the orbital plane of the CSM. The exception was Apollo 11, for which the landing site was more or less on the equator and the CSM's orbit was similarly aligned, with the result that the landing site did not significantly stray from the CSM's ground track. On all the other landing missions, there was sufficient tilt in the CSM's orbit to require a plane change manoeuvre, and in the light of the LM's minimal fuel reserves, it was most efficient for the CSM to burn it. Therefore, as the surface crew began to tidy up after their lunar exploration and prepared to leave the Moon, the CMP in orbit executed a plane change manoeuvre. Changing the plane of the orbit required a burn of the SPS engine of between 10 and 20 seconds. Unlike height adjusting burns that added or subtracted energy from the orbit by firing along the spacecraft's direction of motion, a plane change burn was usually made at right-angles to the orbital plane, often near the point where it crossed the Moon's equator. Preparations for this burn were just the same as for any other SPS burn, except that it was usually made using only one of the two engine control systems in view of its short duration, and similar to the circularisation burn, everything had to be done by the CMP alone. In mission control, the FIDO controller calculated the details of a burn that would achieve the objectives with minimum use of propellant. This information was written on a PAD and read up to the lone crewman, ready to be entered into the computer under Program 30. Richard Gordon was the first CMP to fire the spacecraft's big engine alone in lunar orbit. Rather than make the burn just before the LM returned, he carried it out the previous evening, at the end of the day they landed. "I realised at this time that it had been a real long day and I was tired and more prone to make mistakes. I certainly didn't want to be making mistakes during an SPS burn.'' Normally for any burn, two of the crewmen worked together through a checklist using the 'challenge and response' technique designed to ensure that no step was missed - a luxury the solo CMP did not have. Gordon's solution was to have mission control listen to him as he went through each step. Fortunately, unlike most SPS burns, his plane change burn occurred while he was in communication with Earth and had 14 minutes between acquisition of signal (AOS) and the actual burn. "When I came around this time and had AOS, I chose to go to VOX operation and read the checklist as I performed it, to the ground so they could monitor exactly where I was, exactly what I was doing, and would be abreast of the status of the spacecraft at all times." VOX meant that his transmissions were controlled by a voice-operated switch. Each time the CMP spoke, his words were transmitted to Earth, and there was no need to operate a push-to-talk button. "It gave me the assurance that I was reading the checklist correctly, not leaving anything out. Now, I would think that the ground probably appreciated this. They knew exactly where I was in the checklist, what I was doing, and if I was behind and if I was ahead, so if any particular problem came up, they knew that I was with it or behind it." Without the weight of his two crewmates and their lunar module, the SPS burn felt much more sporty, as Gordon noted post-flight: "The acceleration, of course, is much more noticeable than with the LM docked." If all went well, the role of the CMP appeared minimal in the upcoming orbital ballet of rendezvous, but that was never really the case. It is true that the LM was always the active participant, as it was its responsibility to get off the Moon, into lunar orbit, then find, track and pull alongside the CSM. But the CMP had the role of rescuer in case the LM failed to reach the proper orbit. For this possibility, he had practised a wide range of scenarios where the CSM would become the active spacecraft and would hunt down an ailing LM that had somehow failed to execute the rendezvous. WE HAVE LIFT-OFF... FROM THE MOON! When compared to the fuss and bother of a launch from Earth, with its enormous launch gantries, heavy concrete pads, ground support equipment and launch control facilities, it is almost amusing to consider the relative ease with which two Apollo crewmen tidied themselves up, set their spacecraft ready for launch and pressed a button to get themselves off the surface of another planet. The difference, of course, is that Earth is at the bottom of a very deep gravity well and every last item required for an Apollo voyage had to be lifted through a thick atmosphere and hurled towards the Moon. Such a feat required a vehicle of immense power and complexity, the Saturn V, and a cast of hundreds to send it on its way. The LM ascent stage, on the other hand, was a far simpler machine, as light as could be and it was launching from an airless world whose gravity was barely one-sixth that of Earth with only enough consumables for a few more hours of life support. By the time the advanced Apollo missions got into their stride, NASA had gained enough confidence in the LM to partially power it down during the lunar stay, conserving battery power and permitting 3 days of exploration. In particular, the primary guidance and navigation system (PGNS) was turned off, and turning it back on involved a complete realignment of its guidance platform. As with platform alignments in space, the crew used the alignment optical telescope (AOT) mounted into the top of the LM to sight on a star. A major difference in the procedure came from the use of the direction of gravity as their second reference. Earlier, the crew had temporarily depressurised the LM cabin to throw out any items not needed for the journey to orbit, especially the back packs that had kept them alive on the surface. They would keep their suits on until they returned to the CSM. Other equipment and samples had to be carefully stowed in predetermined positions around the cabin to ensure that the centre of gravity of the ascent stage remained as near to ideal as possible - the further it was from ideal, the more the RCS thrusters had to work during the ascent to maintain the stage's attitude. If the pressure of time allowed, the surface crew would try to test their rendezvous radar on the CSM as the mothership passed over the landing site one orbit prior to lift-off. The rendezvous radar worked with a transponder on the CSM to provide range, range-rate and direction to its quarry. Its dish was mounted above the LM's front face and could move up and down or side to side as it tracked the CSM from a distance of up to 750 kilometres. At the same time, the CMP carried out a tracking program in his computer to help aim the 28-power sextant at the landing site. By taking marks on the LM centred in his viewfinder, he helped mission control to improve their reckoning of the LM's state vector - information that was loaded into the LM computer shortly before lift-off. Mission control then read up a lift-off PAD to both the LM crew and the CMP that gave details of their rendezvous. On later missions, two PADs were sent covering two types of rendezvous - one as a fallback in case the other had to be aborted. With less than an hour to lift-off, the commander gave his RCS thrusters a check by firing them while still sitting on the surface. When Pete Conrad did this, he managed to blow over an umbrella-like dish antenna that he and Al Bean had deployed on the surface for the moonwalk television transmissions. Power was then switched away from batteries in the descent stage to a pair of batteries in the ascent stage. Flight control displays were set up for flight and the abort guidance system (AGS) was initialised to back up the PGNS for rendezvous guidance. Proceeding on through the launch checklist, the surface crew donned their helmets and gloves. They were about to ignite the ascent stage's engine while it sat on top of the discarded descent stage which raised the possibility of the pressure wave from combustion compromising the LM hull. It was therefore wise to be fully suited for the ascent. Then with all checks completed and only a few minutes to lift-off, the crew could make their final preparation to leave the surface. "Stand by. You ready to watch the APS pressurise?" Apollo 15's Dave Scott was checking to make sure that mission control was going to watch the vital signs from the ascent stage's propulsion system, the APS. Its tanks had remained unpressurised until this point. "Okay, let's let her go,'' replied Ed Mitchell, the lift-off Capcom. It had become customary for the LMP from the previous mission to serve as Capcom for ascent as his awareness of what the LM crew were trying to do made him particularly suited to this role. "Roger," said Mitchell. After a brief pause for flight controllers to monitor tank 1's pressure, Mitchell gave the go-ahead for the second tank. "Okay, thank you. Looks good up here,'' replied Scott. "And, Dave, you're Go for the direct rendezvous. Both guidance systems look good; PGNS is your recommendation.'' Mitchell was letting Scott know that, of their two practised methods for rendezvous, the flight controllers recommended that they use the planned-for quick technique called direct rendezvous, and that, of their two guidance systems, they should rely on the primary. "Yes sir, we sure have. We're ready to do some flying,'' replied Scott. "Standing by for one-minute,'' prompted Jim Irwin whose primary task was to look after the AGS and see that its knowledge of the ascent matched that of the PGNS. "Guidance steering is in,'' was his next call as he commanded the AGS to take its guidance information and generate steering commands for the RCS to use in case of an emergency. With a normal ascent, the guidance mode control switch would route steering commands only from the PGNS, blocking those from the AGS. Preloaded with the data from the ascent PAD, the PGNS was nearly ready to ignite the engine. "Okay, Master Arm is On; I have two lights,'' called Scott, as he armed the pyrotechnic system that was about to sever the two halves of the LM, and saw an indication that the circuits were good. "Average g is on..." The DSKY display had blanked to show that the PGNS was now calculating the average acceleration the LM would experience as it flew. In other words, it was now guiding the LM. It just had not ignited the engine yet. On the right side of the cabin, Irwin started a 16-mm movie camera looking out of the window to film the view of the ascent. Scott continued with his steps prior to ignition. "Abort stage." Pressing the 'abort stage' button caused the ascent and descent stages to separate, using explosive bolts to sever the four attachment points holding them together. At the same time, explosive charges drove guillotine blades through the bundles of wiring and plumbing to sever those connections also. The lift-off of Challenger, Apollo 17's LM, from coverage by the rover TV camera. which was its way of asking the crew if they wished it to proceed with engine ignition. Television viewers on Earth were given a ringside seat at the launch of the last three LM ascent stages. These missions included the lunar roving vehicle (LRV), a small fold-out electric car with its own television camera. Before entering the LM for the last time, the commander ensured that he parked his rover 100 metres east of the LM from where this miniature interplanetary outside broadcast station - which was remotely controlled from Earth via an independent radio link - could view the LM sitting on the surface. From this vantage point, it provided coverage of the lift-off itself, and the quiet, still and desolate scene that followed for as long as the rover's batteries and equipment continued to operate. On the last two missions, the surface crew referred to their rover's final resting place as the 'VIP site' - a reference to the stands at Kennedy Space Center in Florida from where very important people could view the Apollo launches. When Apollo 17's ascent stage lifted off, Ed Fendell, the flight controller in Houston who operated the controls for the TV camera, managed to follow the early stages of Challenger's ascent to orbit, despite a 3-second delay between his command to tilt and seeing the result on his monitor. It showed how the ascent stage went straight up for just 10 seconds - yawing a little as it did so to aim the vehicle towards the launch azimuth - then promptly pitched nose down by a little over 50 degrees in order to start adding horizontal speed. This was very different to a launch on Earth, where a streamlined rocket has to rise essentially vertically during the first few minutes to escape the bulk of the atmosphere before it can ramp up its horizontal speed to reach orbit. The lack of an atmosphere on the Moon allowed the LM to start to gain horizontal velocity almost as soon as it left the ground, permitting a more efficient flight profile. ''I observed one sizeable piece of the spacecraft flying along below us for a very long period of time after lift-off,'' noted Armstrong. ''I saw it hit the ground below us somewhere between one and two minutes into the trajectory." Just behind the two crewmen in the centre of the cabin was the cylindrical cover of the ascent engine. Many have remarked on how close they were standing to a rocket engine. As he and Irwin flew along the meanders of Hadley Rille, Scott noted the sound from the engine that was audible through his helmet. ''Both guidance systems are good, Dave,'' called Mitchell as the flight controllers closely watched the numbers coming up on the PGNS and the AGS. As Falcon soared through the lunar sky, Scott noted the gentle wobble imparted on the vehicle by the periodic thrusting of the RCS jets. For simplicity, and to reduce the weight, the ascent engine was fixed. It could not aim its thrust anywhere but straight down along the spacecraft's x axis. As a result, the RCS had to do all the steering by turning the entire spacecraft and therefore aim the ascent engine in the right direction, which it did every 2 or 3 seconds, but using only the downward-facing thrusters. It had been realised that to fire the upward-facing thrusters did not make sense as they would be firing counter to the ascent engine. This rise from the Moon was a critical event. If the APS engine were to underperform, which it never did, there was a real possibility that the LM would not achieve a stable orbit and instead would crash after less than one revolution. Therefore, during ascent, the crew watched the velocity and altitude readings from both of their computers and compared them to charts, looking for any deviations that might indicate a problem. 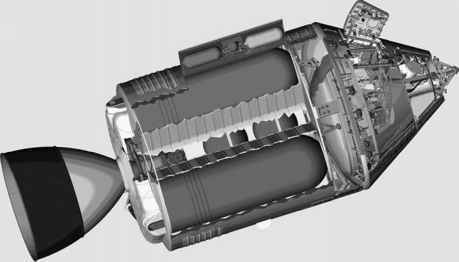 One possibility for an underperforming ascent engine was to augment its thrust with the four RCS jets that were aimed in the same direction. Because the ascent stage was relatively light and the Moon's gravity relatively weak, the ascent engine's rated thrust was only 15.6 kilonewtons, about the same as the first jet engines introduced during World War II. Four thrusters could provide more than one-tenth of that at 1.8 kilonewtons total - a thrust that could make a difference in the later stages of a problematic ascent. With such emergency contingencies in mind, the LM's designers had arranged the RCS plumbing so that, if their own tanks ran dry, they could be supplied with propellant from the ascent engine's tanks. Once the PGNS had determined that the ascent engine had added enough velocity, it commanded a shutdown. Immediately, the crew quizzed the computer on the size of the orbit they had achieved. ''PGNS says it's in a 40.6 by 8.9,'' reported Scott as soon as Falcon had entered orbit. The numbers showing on the DSKY represented the altitudes of the apolune and perilune respectively, given in nautical miles. Their orbit appeared to be 75.2 by 16.5 kilometres, which was only slightly lower than desired. Although their tracking data put the orbit a little higher than Falcon's at 77.8 by 16.7 kilometres, the trajectory experts were happy that the rendezvous could go ahead as planned.